The flowers took their time(!) - but it looks well worth it! I suppose we are ALL learning what to do (& what not to do) as we go along. Based on this principle - we should have a GREAT garden in oooh - about 10 years time!! If you know ANYONE who knows more about gardening than us - please give them this blog address - there has got to be a better way than just planting seeds & hoping for the best!? Please tell all the kids who did this for ALL us residents, we ALL say a BIG thanksyou. 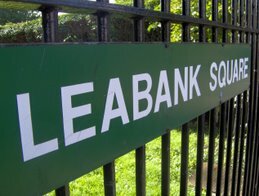 We should ALL be very proud of the kids in Leabank Square, they show the whole of Hackney just what it is to be a model citizen. I love living in Leabank Square now! I LOVE the flowers at the front of the green. Can you do a few postings about the different flowers we have in Leabank Square? I know nothing about flowers & gardening - but would love to learn what we have here on our doorstep.